Erica received her undergraduate degree from Amherst College in Physics, and an M.S. in Physics from the University of Michigan. Pursuing a desire to do conservation-relevant science, she worked as a field ornithologist for many years. 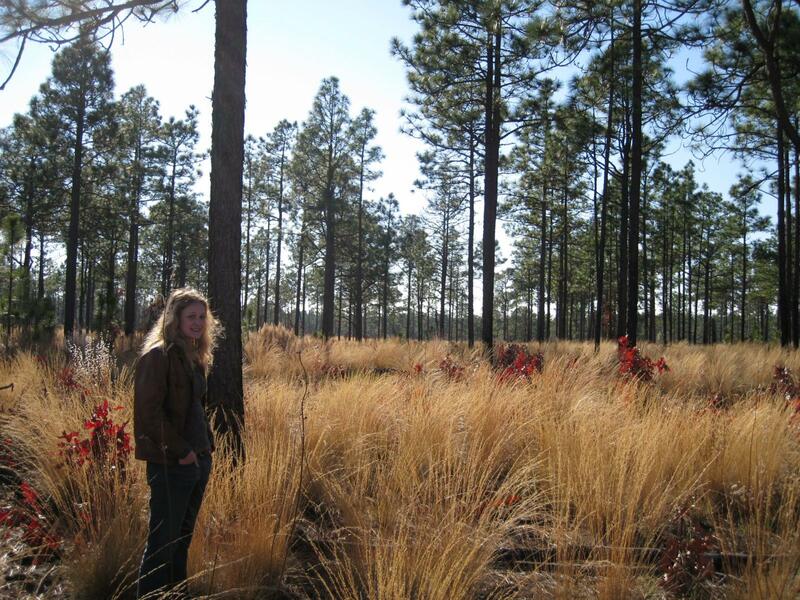 In the pine-savanna of North Carolina, she learned land management and restoration techniques including prescribed fire, and eventually became a Burn Boss capable of leading prescribed fires. Erica returned to graduate school at UC Berkeley to study disturbance ecology, and is now using information entropy methods to develop a quantitative system to compare effects of various ecological disturbance on biological communities. 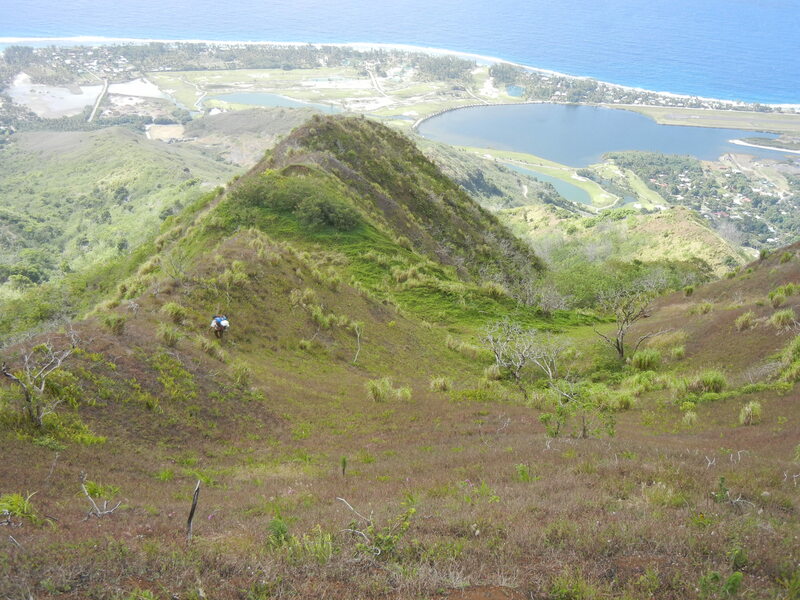 The ecosystems Erica studies include those in which the vegetation has co-evolved with natural disturbance (such as serotinous Bishop pines and wildfire, and Rocky Mountain wildflowers and landslides), and those that are now exposed to human-induced disturbance (such as introduced grazing animals in high Sierra meadows, and novel wildfire activity that threatens cloud forest biodiversity in The Society Islands of French Polynesia). Erica has already been trained as a physicist, but her curiosity draws her to ecology. ERG has become a unique place for Erica to explore her aspirations in the biological sciences alongside those who have successfully trekked through similar transitions. Erica’s niche is fire, particularly in the ecologically sensitive region of French Polynesia. Read in her own words how Erica has fine-tuned her fascinations while at ERG. Although I had both quantitative training and skills required for field biology, until that point, no centralized theme drove my studies—it was more of a pure curiosity towards the world that guided me. During my time helping with prescribed burns in the North Carolina pine savannas, it occurred to me that sometimes fire promotes biodiversity (as it did there) and sometimes fire is devastating to biodiversity (as in the wet tropics). Fire can interact with climate change by releasing soil carbon into the atmosphere, but in some cases, it will act as a pump to pull carbon out of the atmosphere and store it in soils via burned biomass. It became apparent to me that I had both questions and skills, and it was time to go back to school. ERG was in many ways an ideal program for someone like myself, working across multiple disciplines, concerned about the world at large, and asking targeted questions. Now I work in the field of “disturbance ecology,” which has many of the answers about fire-biodiversity interactions that I was originally seeking. I think of disturbance ecology as the piece of the puzzle that bridges human activities and their ultimate effects on biodiversity. Any understanding of the way that communities of organisms are likely to change under climate change scenarios will come from what we know about how organisms and biological communities have evolved with natural disturbances, and how they respond to novel and anthropogenic disturbances. 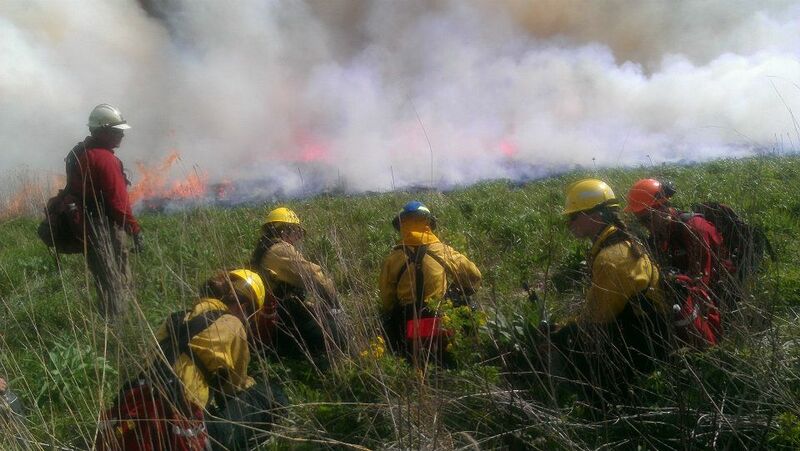 Erica (second from right) burning Iowa prairie with the Nature Conservancy Training Exchange during her graduate studies. In my dissertation, I have focused on using an information entropy-based method of ecology to quantify patterns in ecosystems, (Harte and Newman, TREE 2014) and applying these methods to field data I’ve collected during my dissertation to compare effects of natural and anthropogenic disturbance (discussed, in part, here: Newman et al., Ecology 2014). This topic continues to fascinate me and will be a large component of my future research program. Working with members of the Délégation à la Recherche and Tahitian conservation group Te Rau `Ati `Ati to quantify effects of human caused fires on vegetation communities in French Polynesia. Fairurani ridge burned in 2008, and grew back in grasses rather than the wet, montane forest that was there previously. I took two classes during my graduate coursework that changed my research in fundamental ways. These were Fire, Insects and Disease in Wildland Ecosystems (Environmental Science, Policy and Management 134), and Isha Ray’s Social Science Methods course (Energy and Resources Group 273). The first taught me how to walk into a new ecosystem and assess the major processes governing growth and mortality in plant communities—an invaluable skillset for my current work in French Polynesia, where wildfire has never been studied before. The second taught me how to think about establishing common ground with people whose culture I don’t share—again, invaluable for my French Polynesia work, where I have interviewed firefighters in translation about changing fire activity. I recommend these courses to everyone, and I also recommend ERG to budding quantitative ecologists.